When a debt puts his life in danger, Chris (Emile Hirsch) hatches a plan to kill his unruly mother and claim her life insurance policy. With the backing of his defeated father, Ansel (Thomas Haden Church), narcissistic step-mother, Sharla (Gina Gershon), and impressionable younger sister, Dottie (Juno Temple), Chris hires Killer Joe Cooper (Matthew McConaughey), a detective who moonlights as a contract killer, to carry out the dirty work. But when they can’t afford his upfront fee, Joe requests Dottie as a retainer, leading to an ultimate showdown when their seemingly foolproof plan backfires. Adapted from his own play, Tracy Letts’ narrative takes the audience into the nuts and bolts of Chris’ less-than-ideal life, the relationships he has with his scrambled family and the desperate plan he’s forced to resort to when his life teeters on the edge – one that brings about a number of twists and turns and an untrustworthy figure who threatens to disturb the dysfunctional, yet workable balance by taking Dottie away. It’s a screenplay that’s peppered with an uncomfortable amount of dark humour, mostly residing in Letts’ sharp, back-and-forth dialogue, and the presentation of a family of repugnant individuals who have no moral compass and simply use and abuse each other for their own benefit. 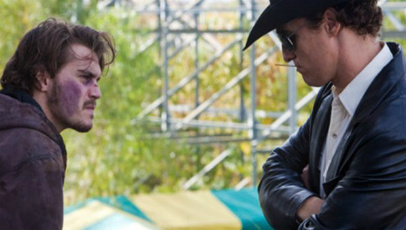 With the action more-or-less limited to the run-down interior of the family’s trailer, Killer Joe is every bit as intense and deeply unsetting as it is uncomfortably relishable and amusing. William Friedkin’s terrific direction superbly accentuates the characters’ desperation and Joe’s increasing hold on them. The uncompromising way in which Friendkin shoots, coupled with the tightly packed sets and inherently scratchy quality, adds a touch of forced observation to the way in which the unexpected twists and turns of the narrative play out, particularly when it comes to the blood-splattered and perplexing finale. It’s, however, all in keeping with the deplorable attitudes these characters possess. As much as Letts and Friedkin succeed in their respective responsibilities, its through the cast’s dedicated, unabashed performances that Killer Joe secures its merit. McConaughey’s performance is masterful, transforming Joe from the silent figure with the perfect image he’s introduced as, into the cold-hearted monster he becomes. Temple shines as the vulnerable Dottie. Her ability to attribute Dottie with a smidgen of humility is a skill in itself, meaning her performance as a whole is nothing but revelatory. Hirsch, Haden Church and Gerson provide excellent support in their equally centric roles. Killer Joe isn’t a film that will appeal to everyone. Even those to whom it does are likely to spend hours questioning its purpose and overall worth. It’s one, however, that, as well as presenting a no-holds-barred attitude to violence that should be praised rather than written-off as sleaze, contains some of the best performances of the year. And, in the case of McConaughey and Temple, perhaps the best performances of their entire careers.